OZCO Building Products T4-850 Oz-Post for 3-1/2" Square Post | Hoover Fence Co.
Oz-Post™ represents both a change and advance in the concept of ground supports of a magnitude not seen for many years. Oz-Posts™ replace the traditional method of installing fence, signs, decks, and any other round or square posts. Oz-Posts™ are driven into the ground in minutes instead of spending hours digging holes and filling with concrete. Oz-Posts™ are available for nearly every size post you may need to install. Tests show that the Oz-Post™ is every bit of reliable as traditional post installations. Also, Oz-Posts™ are fully retrievable and reusable allowing structures to be moved with no capital waste. As a result the Oz-Post™ can be used as both a permanent or temporary post installation system. Both on insertion and removal there is little or no environmental impact and wood posts are protected from rot caused by soil and moisture. An Oz-Post™ can be easily installed in less than four minutes by only one person. The dramatic time savings compared to traditional methods will provide for a cost reduction and significant improvements in labor efficiency. Oz-Post T4-850 Specs: 2mm hot dipped galvanized steel. Post is 34" long and the top sleeve is 6". Are Oz-Posts as strong as concrete? 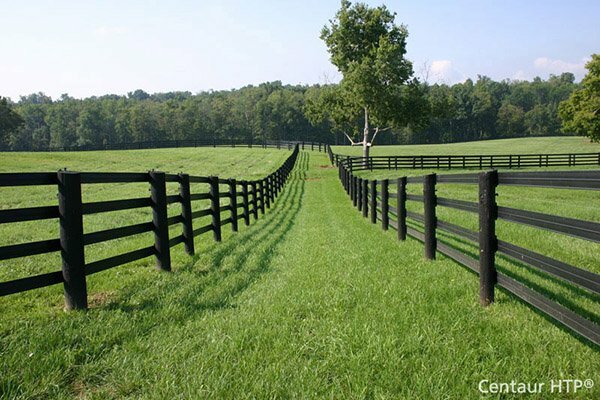 Oz-Posts have been tested to high levels of horizontal forces and have been found more than suitable for the majority of fencing and sign projects. A fence or sign constructed as recommended using Oz-Posts will be equally as strong as traditional concrete installation. A post placed in a standard 6"- 8" post hole with one or two bags of concrete takes minimum of an hour to install. (not to mention a day to dry) This method is not any stronger than an Oz-Post installed by one person in four minutes. Testing has proven that the weakest part of almost any fence installation is the wooden or metal post. This also holds true for an Oz-Post installation. Testing has shown that the post will break or bend before the Oz-Post fails when installed as recommended. Of course Oz-Posts and 6"- 8" post holes with concrete are not suitable for all fence designs or all signs but most standard fence designs and signs allowed by city councils can be installed with the Oz-Post system. If you have any questions on the suitability of the Oz-Post system for your next project feel free to call our customer service department for more information. The maximum recommended height for a wood fence is 8' with post spacing at 6'. For a chain link fence the maximum recommended height is 8' with post spacing at 8'. (Please confirm with your local authority as these height restrictions may vary depending upon your location). What length should my posts be? The Oz-Post anchor system will drive with the top near flush with grade. You will therefore need posts for 'above ground'. For a 5' high chain link fence, terminal posts (end posts, corner posts, and gate posts) would normally be left out of the ground 1" taller than the height of fence being installed, 5'-1". Chain link line posts, or intermediate posts, would normally be installed at 4'-9", 3" less than the height of fence being installed. The loop cap which fits on top of the chain link fence and toprail will account for the difference. You may wish to order posts a little longer than this and cut once set if you'd like to be more on the 'safe' side of things. We do offer chain link posts cut to the foot and fraction of an inch. What size and type should I use? The size and style of Oz-Post is determined by post materials that you intend to use. For some post sizes Oz-Post offers several different styles for various applications. A good rule of thumb is to use the longest Oz-Post that can be easily driven into the ground. The more firm and compacted the ground is the shorter the Oz-Post you will require. If you have a special application that you would like to use Oz-Posts for let us know we more than likely have a special model for your needs. What happens if I hit Rock? The Oz-Post becomes an extension of your jackhammer. As a result it will break through loose shale and some rock. Smaller boulders will be pushed aside as the Oz-Post penetrates the ground. You may need to straighten the assembly a few times as the Oz-Post hits and deflects small boulders. Large solid bedrock and boulders cannot be penetrated by Oz-Post, in these extreme cases you will have to move the hole, or try a shorter or tapered Oz-Post. Remember a bobcat or post-hole auger will not penetrate most of the softer rock or concrete that Oz-Post can easily handle. Both Oz-Post and traditional methods will not penetrate solid rock! Yes, Oz-Posts can be extracted if they are placed in the wrong spot, the fence needs moving, or they are only temporary. In lightly compacted soil conditions you can remove Oz-Post by using a 6' long pry bar. Place the pry bar under the housing, and using a piece of wood or a concrete building block placed at approximately 10" from the Oz-Post you can lever the Oz-Post out of the ground. If this fails your Oz-Post distributor can sell or rent you an Oz-Puller to make this process much easier. What if the ground becomes water-logged? Ground soil will expand and contract depending upon the water saturation levels. This is a natural property of ground soil and cannot be avoided. Due to the large surface area of the Oz-Post fins there is a high level of adhesion of the soil onto the Oz-Post. This helps to give Oz-Post their lateral strength and support. Where the ground is very water logged you may notice some increased movement in your fence, as the ground dries this deflection in your fence will decrease back to usual levels. It should be noted that these effects and properties are also evident when constructing a fence using concrete. How does wood shrinkage effect Oz-Post? Shrinkage in wood is a natural property, as moisture is absorbed and evaporated from the timber. This is not a concern as the Oz-Post housing fully encapsulates the timber post and also allows for drainage. It is recommended that the hardware be tightened 2-6 months after installation to assure the tightest possible connection. The use of a small amount of polyurethane glue is a great option to allow for a strong connection without the need to retighten the screws. Please review installation instructions for the model that you are installing for all installation options. Shrinkage is a far greater problem when considering posts that have been secured using concrete. As the timber shrinks (the concrete does not) a concrete container is created which inevitably will hold water, thus your timber post becomes submerged until the water drains, a great environment for fungal decay. This is one of the reasons why posts rot out before the fence pickets and rails. Oz-Posts protect the wood posts from premature rot because they drain well and separate the wood from the soil. Oz-Posts perform excellent in both warm and cold climates. Frost is a force that can easily ruin any kind of post installation that is not done correctly. In areas that experience below freezing conditions evidence of damage caused by frost is easy to spot and very common. The best and easiest solution for this problem is Oz-Post! Posts that have been installed with post holes and concrete can be heaved out of the ground by the freezing and thawing of the surrounding soil. If the buried concrete has rough sides frost can grab the post and heave it out of alignment and eventually completely out of the ground if it is left unattended. To assure that the concrete has smooth sides it is recommended that paperboard sleeves like sono-tubes be inserted in the augured hole to produce smooth sides and help prevent movement from frost. The use of sono-tubes is highly recommended for frost prone areas. This adds additional cost to traditional installations that should be considered when comparing with the Oz-Post System. In addition to smooth sides it is recommended that the post hole have an enlarged bottom like an upside down mushroom. This technique reduces the likelihood of the post being heaved. This is very time consuming and costly as it increases concrete requirements and removal of excavated soil. WARNING: many fencing contractors and do-it-yourselfers do not install fence posts this way and that is why you can often see crooked fence posts and sign posts throughout your neighborhood. On the contrary the long, wide and smooth fins of an Oz-Post give the frost nothing to grab onto to push it out of the ground. In addition, an Oz-Post has a generally pointed shape and does not produce a horizontal plain for the shifting/expanding soil to push out of the ground. You can also think of it another way; it is much easier to push a pointed object into the ground (like an Oz-Post) then it is a blunt object (a wooden post). With frost heaving the exact opposite principle occurs. When the sub-terrain moisture expands from below freezing conditions it can easily push the blunt end of a post and or concrete out of the ground but because an Oz-Post is pointed with no blunt surfaces frost can't push it out of the ground. Oz-Post installations are far less likely to be heaved by the frost compared to the blunt and rough artificial rock that is formed with concrete. If for whatever reason a post installed with Oz-Posts is heaved out of alignment it can easily be driven back in the ground or removed and reinstalled in the correct location. The same operation with a concrete installation would prove to be very costly and time consuming. In addition to Oz-Posts tremendous long term performance in frost prone areas they can be installed even if the ground is already frozen! Can Oz-Posts be used on a Gate? Our exclusive Oz-Hammer is a high grade steel attachment that fits most common jackhammers. The Oz-Hammer transfers vibrating forces of the jackhammer to the Oz-Post. You may need to get a Hammer-Spacer to adapt the Oz-Hammer to the Oz-Post model that you are using. See our web site to determine which Oz-Posts require the Hammer-Spacer. If you are planning to rent a jackhammer most rental centers have Bosch, Brute or Wacker 60# electric jackhammers that are perfect for any size job. There are also gas powered jackhammers (Wacker model BH-23 is one popular brand) that are great for remote locations where power cords or generators would have difficulty reaching. Air operated jackhammers will also work, but are not recommended because they are very heavy and much more difficult to handle. There are many other jackhammer brands and most of them will do the job. To be sure, the main feature that the jackhammer will need is to have a 1 1/8" hex chisel holder with a retaining collar. Custom Oz-Hammers can be made for those who would like to use their existing equipment. The Hammer-Spacer is an adapter for the Oz-Hammer. An appropriate Hammer-Spacer is REQUIRED for many Oz-Post models. Please refer to your spesfic model to confirm if a spacer is required. You cannot install Oz-Posts that require a Hammer-Spacer without one.